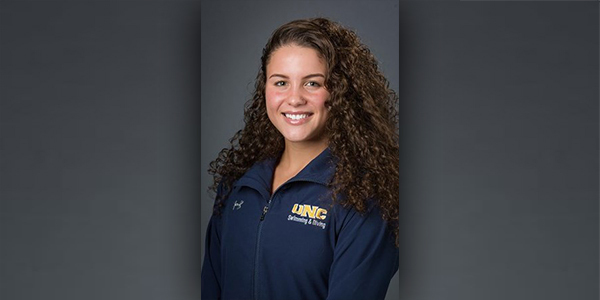 Bermuda’s Madelyn Moore — who competes for the University of Northern Colorado swim team — won two events at a recent meet, swimming to victory in the 50 and 100 freestyle, as well as being part of the winning 400m relay team. The school’s report noted, “Northern Colorado swim and dive fought back after an early deficit against Colorado State, but it wasn’t enough as the Rams edged the Bears 158-142 on Friday night. “The two teams split first and second place in all 16 events, while the Rams took third in nine of the 16 events to just beat out UNC in the meet. “CSU jumped out to the early lead against the Bears by taking four of the first five events, making UNC play catch up for most of the meet. “Rose Saya and Maddy Moore each had impressive nights in the pool, both taking two individual events and being on the winning 400 free relay team at the end of the meet. “Saya won the 200 and 500 free, while Moore won the 50 and 100 free. Saya touched the wall in the 200 free at 1:54.30 and took the 500 free with a time of 5:03.84. “In the short length freestyle races, Moore won with times of 23.78 and 52.21 in the 50 and 100, respectively.